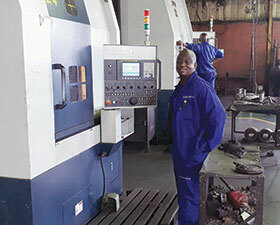 Through BMG’s acquisition of Rustenburg Engineering and Joerg Foundry in 2018, the company is now a major player the foundry industry. “This strategic investment in a dynamic sector of engineering broadens BMG’s product range to include the supply of SG and cast iron components and products to original equipment manufacturers and end-users,” says Anton Kritzinger, general manager of Rustenburg Engineering, which now forms part of the Engineering Solutions Group (ESG) business segment of Invicta Holdings Limited. This acquisition is also a boost to the Fenner brand. BMG acquired Fenner Power Transmission over 20 years ago and is the exclusive distributor locally of highly acclaimed Fenner products. Joerg Foundry has been manufacturing Fenner Power Transmission components under licence since 2011 and this new agreement provides exciting opportunities for all companies. “Fenner conveyor belting products, which include steel cord and solid woven conveyor belting, are manufactured at the Fenner Isando plant. However, whenever castings are required, we are able to source them from Rustenburg Engineering and Joerg Foundry,” continues Kritzinger. Rustenburg Engineering and Joerg Foundry operates as a medium-sized iron foundry, producing castings for original equipment manufacturers and end-users in a range of internationally compliant material specifications. Manufacturing facilities include a no-bake resin sand foundry for jobbing and short runs and a green sand foundry for production runs. The company’s expertise covers a range of capital equipment and consumable components used in diverse sectors, including mining, earthmoving, chemical, water, transport, rail, sugar, paper, agriculture, construction, mechanical power transmission and general engineering. Typical products cast include wheel hubs, rod ends, torque plates, castle nuts, brake shoes, bearing and motor housings, rail components and flange couplings, as well as pulleys, valve bodies and diaphragms. The company also manufactures mill and barrel liners, wear plates, chill moulds, crane wheels, sheaves and bearing housings.